Make a commitment to safety. FREE guides to help you avoid the purchase and use of sub-standard, dangerous electrical products and services. The SAFEhouse Association is a non-profit, industry organisation committed to the fight against sub-standard, unsafe electrical products and services. 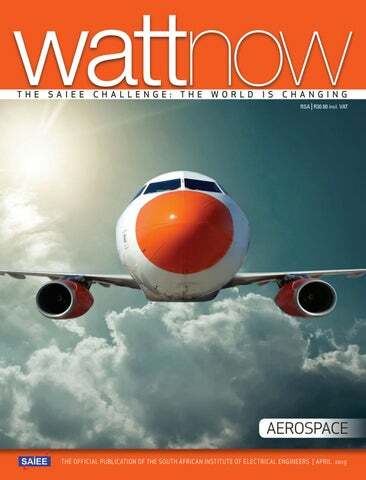 This issue of wattnow features Aerospace. Aerospace is the human effort in science, engineering, and business to fly in the atmosphere of Earth and surrounding space. Aerospace organisations research, design, manufacture, operate or maintain aircraft or spacecraft. 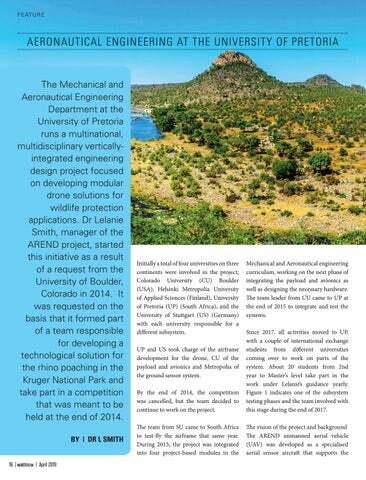 Our first article, on page 16, written by Dr Lelanie Smith, Manager on the Arend Project from the University of Pretoria, shares with us the design project which focuses on developing modular drone solutions for wildlife protection and application. 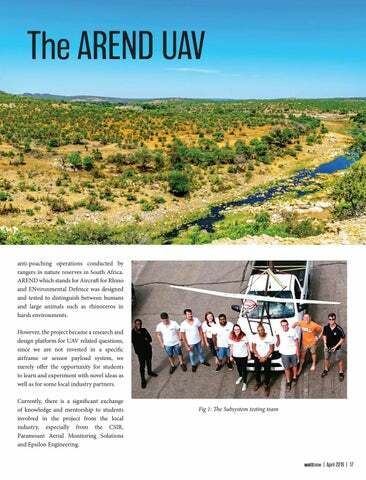 Page 12 sports an excerpt of a white paper, published by Airbus in 2018 about the different segments industry can address the challenges Africa faces - “Aerospace Technologies in Africa”. The Department of Science and Technology has welcomed the adoption of the Integrated Environmental Management Plan for phase one of the Square Kilometre Array (SKA). Read the story on page 34. Dudley Basson did not disappoint with his extensive article on “Coronal Mass Injections” on page 42. 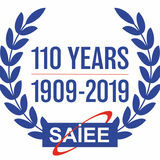 The SAIEE recently inaugurated its 2019 President, Mr George Debbo, who is currently touring the country for his inaugural address. For those of you who cannot make these events, watch out for the next issue of the wattnow, which features the SAIEE and all our committees, sections, interest groups, etc. George is busy writing his presentation into article format which will be published in the May issue. For those of the SAIEE stalwarts who would like to share with us your anecdotal stories about the SAIEE, please send it to me by 3 May. To all our readers celebrating Easter, Happy Easter. Herewith the April issue, enjoy the read. Visit www.saiee.org.za to answer the questions related to these articles to earn your CPD points. Digital Transformation has contributed significantly to enabling inclusivity in areas such as economic and social development of the disadvantaged sectors of our society. This address discusses both the benefits and disadvantages of Digital Transformation, as well identifies the key digital technologies that have contributed to both Digital Transformation as well as Digital Disruption, the latter also being a significant contributor to Digital Transformation. The address will also cover the current barriers that are hindering the progress being achieved with Digital Transformation, especially within the South African context, and proposes how the South African Institute of Electrical Engineers (SAIEE) can get involved in the public debate related to Digital Transformation, and the setting of policy in this context. This strategy was formulated to complete the modernising of the telecommunications network by converting outstanding electromechanical exchanges to digital exchanges. By eradicating the waiting list, Telkom added one million telephone lines into underserviced areas (predominantly the previously independent TBVC states). In 1999 Debbo left Telkom to join the vendor community, first as Technical Director for Marconi South Africa and then as Chief Technical Officer for Ericsson Sub Saharan Africa, following Ericssonâ&#x20AC;&#x2122;s global acquisition of Marconi PLC in 2006. During his time within the vendor community, he was responsible for many significant projects including the deployment of ADSL technology in South Africa, the implementation of the first metropolitan and access fibre network in Africa which took place in Kampala Uganda and the deployment of the first 4G mobile network which took place in Angola. In 2012 George left Ericsson to set up his own business as an Independent Telecommunications Consultant. Debbo has been an integral part of the telecommunication industry in South Africa for over four decades. He started his career in the South African Post Office (SAPO), which later transformed into Telkom SA on commercialisation in 1991. As a pupil technician, he progressively rose through the ranks to Executive level before he left in 1999 to further pursue his career in the vendor community. During his time at Telkom, he was responsible for many engineering projects including research to increase the robustness of pulse code modulation systems to lightning interference. He was actively involved with the deployment of synchronous digital hierarchical (SDH) technology into the transmission network. In 1994, he championed the implementation of long haul optical fibre and the formulation of the Vision 2000 strategy. Debbo was responsible for two of the most significant projects Telkom has ever launched in South Africa. The first project was the deployment of telecommunications infrastructure to service the first democratic General Election in 1994, for which he earned the Telkom Managing Directorâ&#x20AC;&#x2122;s Award. In 1995 he headed the development of the infrastructure required to support telecommunication and television services for the Rugby World Cup. regularly called upon to address conferences on this technology. In terms of academic qualifications, Debbo has a BSc (Elec.Eng) and an MSc (Elec.Eng) degree, both obtained from the University of the Witwatersrand and is a registered Professional Engineer with the Engineering Council of South Africa (ECSA). Now, as part of the Presidentâ&#x20AC;&#x2122;s inaugural tour and to deliver his address, George Debbo will be visiting some of the SAIEE Centres nationwide. Visit the events calendar on the SAIEE website www.saiee.org.za to see when he will be in your area. From left: Prince Moyo (SAIEE Junior VP), Prof Pat Naidoo (Past President), Jacob Machinjike (Past President), Dr Hendri Geldenhuys (Immediate Past President), Sicelo Xulu (SAIEE CEO), Stan Bridgens (Past President), and Leanetse Matutoane (Ops Manager). 2019 SAIEE OFFICE BEARERS During the proceedings of the evening, the following 2019 Office Bearers we inaugurated for 2019: Deputy President: Mrs Sy Gourrah Senior Vice President: Prof Sunil Maharajah Junior Vice President: Mr Prince Moyo Honorary Treasurer: Mr Viv Crone Honorary Vice President: Mr Marius van Rensburg Immediate Past President: Dr Hendri Geldenhuys We wish them all well in their future endeavours carrying the SAIEE flag high! A thorn amongst the roses? From left: Tshego Cornelius, AndrĂŠ Hoffmann (Past President), Sharon Mushabe and Prudence Madiba. renewable offerings can be applied across the photovoltaic solar, thermal solar, wind energy and hydro-generation areas. He says, “I’m looking forward to adding positive value to DEHN Africa and helping to build a strong DEHN Africa brand, engaging with both local and international clients. My previous employment history includes 10 years in branch management in the pulp and paper industry, as well as eight years in specialised electrical sales and sales management. I believe that my strengths include my knowledge of the market segment, my 18 years accumulated sales and sales management experience and my knowledge of regional African markets.” “Joining DEHN Africa will allow me to apply my accumulated experience in a young and dynamic environment and challenge myself. I truly believe in the services and products DEHN Africa brings to the market and the value it adds to consumers,” concludes Van Wyk. SAIEE inducted new Fellow At Dr Hendri Geldenhuys’s last Council meeting as SAIEE President, he inducted a new Fellow to the SAIEE. Mr Jan Oberholzer is the Chief Operating Officer for Eskom Holdings SOC Limited responsible for the effective leadership of the Group’s Generation, Transmission, Distribution, Customer Service and Group Capital Divisions. For a few years, he was an independent professional providing professional services in the African Power Industry focussing on a) business and performance management, b) business development, c) capital programme management and d) project & construction management. needed to avoid any risk of fire or oil leaks. They also needed a product that would require little to no maintenance.” The second contract was a repeat of the initial order, and comprises two 800 KVA units, one 1,600 KVA unit and one 2,000 KVA unit as well as a further two transformers, 1,600 kVA and 800 kVA which will replace two existing oil filled transformers. Demonstrating its flexibility in meeting specific customer requirements, Trafo Power Solutions designed the solution to cater for the mine’s unusual voltage levels of 13,2 KV/480 V at 60 Hz. The First IoT Council of South Africa AGM The IOT Industry Council of South Africa (IOTIC) announced that it has been formally constituted as a new industry representative body, holding its first Annual General Meeting on the 15th of March in Johannesburg. (commercial industry players), Observer Members (government organisations, NGOs, research organisations), or Individual Members (analysts, academics, entrepreneurs) through the Website, www. iotcouncil.org.za. Events calendar for the next 12 months – this calendar will have planned events such as seminars, webinars and panel discussions that will be hosted by the Chapter in the immediate future. The schedule will be shared with the LRC members, and it will also be published in the wattnow magazine. 2. Monthly member meetings – members of the LRC will receive an invitation for the monthly member meetings. The Chairperson indicated that these meetings will be a combination of remote sessions (such as teleconference, Skype, etc.) and local venue meetings. The details will be made available to the members soon. The LRC invite all persons interested in the load research subject to join and contribute towards the betterment of the ESI in South Africa. To be part of the LRC, contact the Lloyd Setlhogo (Secretariat). Please note that you will be expected to register with SAIEE once you have joined the Chapter. The schedule for the upcoming, exciting and CPD accredited events will be released in due course. SAIEE are missing the following members... we need your help! To not just delete uncontactable members, the SAIEE is hoping to make contact with the following members who can not be reached via email or telephone. If your name is on the list, or you know a person on the list, please ask them to contact the SAIEE Membership Department and speak to either Joanne Griffin or Connie Makhalemele-Maseko on 011 487 3003. Alternatively, log into/or create your online profile on www.saiee.org.za with your correct details. We hope to hear from you soon! through higher education. She reminded them that Pro maths Alumni Chapters are based at eleven universities throughout South Africa, including Wits University, University of KwaZuluNatal Westville Campus and the Cape Peninsula University of Technology amongst others, to support newly enrolled students through their journey. Department of Education Representative also attended the awards ceremony, Anil Pillay He emphasised the importance of attaining a sound education to improve career prospects and ensure a positive future. Mbasa Mguguma from Khulani High School was recognised as the top performer in maths with an outstanding score of 97% and Someleze Mjekula from Ulwazi High School was the top performer in physical science with a remarkable achievement of 100%. Kutlwanong Centre for Maths, Science and Technology has 22 Pro Maths Centres throughout South Africa and has helped over 20 000 pupils over the past 13 years. Initially a total of four universities on three continents were involved in the project; Colorado University (CU) Boulder (USA), Helsinki Metropolia University of Applied Sciences (Finland), University of Pretoria (UP) (South Africa), and the University of Stuttgart (US) (Germany) with each university responsible for a different subsystem. Mechanical and Aeronautical engineering curriculum, working on the next phase of integrating the payload and avionics as well as designing the necessary hardware. The team leader from CU came to UP at the end of 2015 to integrate and test the systems. By the end of 2014, the competition was cancelled, but the team decided to continue to work on the project. Since 2017, all activities moved to UP, with a couple of international exchange students from different universities coming over to work on parts of the system. About 20 students from 2nd year to Masterâ&#x20AC;&#x2122;s level take part in the work under Lelanieâ&#x20AC;&#x2122;s guidance yearly. Figure 1 indicates one of the subsystem testing phases and the team involved with this stage during the end of 2017. UP and US took charge of the airframe development for the drone, CU of the payload and avionics and Metropolia of the ground sensor system. anti-poaching operations conducted by rangers in nature reserves in South Africa. AREND which stands for Aircraft for Rhino and ENvironmental Defence was designed and tested to distinguish between humans and large animals such as rhinoceros in harsh environments. However, the project became a research and design platform for UAV related questions, since we are not invested in a specific airframe or sensor payload system, we merely offer the opportunity for students to learn and experiment with novel ideas as well as for some local industry partners. Currently, there is a significant exchange of knowledge and mentorship to students involved in the project from the local industry, especially from the CSIR, Paramount Aerial Monitoring Solutions and Epsilon Engineering. Fig 2: The AREND UAV flight for optimal image capturing. An onboard processor is used to process the high-resolution images and only send GPS coordinates through the communication link to avoid bandwidth challenges. Figure 2 shows the final design of the AREND UAV. The University of Pretoria’s Faculty of Engineering, Built Environment and Information Technology (EBIT) is a leader in the provision of tertiary education and research opportunities in the fields of engineering, the built environment, information technology and engineering technology management on the African continent. Fig 3: AREND UAV during April 2018 test flight. major subsystems: the primary flight control subsystem and the variable payload subsystem. The primary embedded subsystem consists of the propulsion system, the autopilot and flight control system, the communication link for manual control and the central power distribution system. The payload embedded subsystem consists of the payload sensors, the camera gimbal and a dedicated power distribution system. The data communication link and payload processor are shared between the primary and payload embedded subsystems for telemetry and sensor data downlink and to integrate payload sensors with flight controls, respectively (Koster et al., 2016). THE FUTURE OF AREND At present, the team is working on preliminary tests with the catapult launch system after which the attention will move to the embedded systems and variable payloads. AREND will provide a platform for UP and local industry to test-run sensor payload concepts and a variety of aircraft configurations to improve aerodynamic efficiency. This will take place within the engineering education context by providing students with mentorship and opportunities for soft skill development and innovative, practical problem solving and application. We are dependent on the expertise and financial support from industry and remain open to any relief, locally or internationally. If you are interested in helping or wanting to follow us, we have a Facebook page - @teamAREND. Airbus released The Great Enabler: Aerospace in Africa - a white paper on the role of aerospace technologies and their impact on socioeconomic development in Africa. The extensive report looks at how different segments of the industry can address a core set of challenges on the continent by: increasing access to healthcare; enhancing food security by making African agriculture more competitive and sustainable; promoting education, training and innovation; empowering businesses with innovative products and solutions; and breaking down barriers to the movement of people and goods across Africa. Many African countries are final consumers in the global aerospace value chain. Joining the ranks of producers in this value chain is challenging for many but not impossible. The examples of Africa’s current leaders in aerospace – South Africa, Tunisia and Morocco – demonstrate the complexities but also the opportunities for African countries to develop aerospace manufacturing and industrialisation capacity. Key among these opportunities is Africa’s potential demographic dividend, which will be achieved by investing in its youthful and increasingly techno-savvy population. The key question remains how to connect people to markets and goods in a faster, cheaper and more efficient way to maximise the sector’s role as an economic engine and a vehicle for greater integration in Africa. This is perhaps the most significant pillar of the continent’s sustainable development. However, despite employing more than 60% of Africa’s population, the sector contributes only about 15% of the continent’s GDP as underlying challenges persist. Aerospace technology such as precision farming could potentially reverse this situation by enabling farmers to produce more with less. 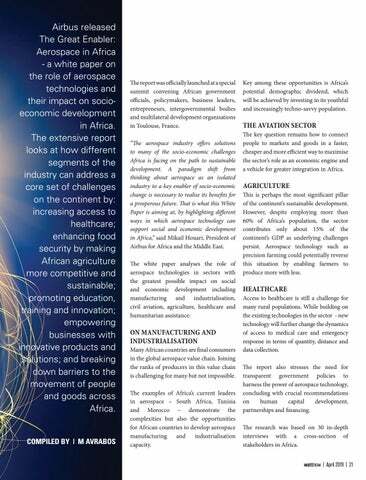 Aerospace Technologies in Africa continues from page 21 Herewith an excerpt of “The Great Enabler - Aerospace in Africa”. Historically, the global aerospace industry has driven social and economic transformation around the world. Aerospace has since the beginning enabled many technological breakthroughs facilitating the connection of people, countries and cultures, providing access to global markets and generating trade and tourism. Aerospace technologies have furthered our horizons, expanded access to education and information to the most remote areas on the planet, and revolutionised how people and businesses connect and create wealth thus improving the living standards of millions of people around the globe. The aerospace industry offers solutions to many of the socio-economic challenges Africa is facing on the path to sustainable development. A paradigm shift from thinking about aerospace as an isolated industry to a key-enabler of socio-economic change is necessary to realise its benefits for a prosperous future. That is what this White Paper is aiming at, by highlighting different ways in which aerospace technology can enable social and economic development in Africa. Figure 1: Trend in Working-Age Population (15-64) in Africa To pursue these approaches in aerospace, government officials and policymakers must implement clear and realistic strategies to enable countries to reap the benefits of this robust and impactful industry. to come from young people between the ages of 15 and 24. According to the latest estimate, the populations of 26 African countries are expected to double their current size between 2017 and 2050. The competitive opportunities offered by Africa’s population growth align closely with opportunities and changes in the aerospace industry at large. To understand these opportunities, one must first look at demand and trends in commercial aerospace globally. The commercial aircraft segment offers a good example. Air transport’s centre of gravity, as measured by demand for air transport services, has moved South and East over the last thirty years. In 2017, 30% of emerging country populations took a flight. By 2037, 85% of emerging country populations will fly. As such, the global fleet of aircraft is expected to double over the next 20 years. – is what government officials and policymakers should seek to replicate and support across the continent both before and after their inception. Simply put, the shared goal between the public and private sectors is to increase the number of these interactions and create an environment that supports both the individuals who have ideas and institutions that have capital and know-how. This is what leads to growth. minds tend to leave to the continent due to inadequate resources such as equipment and research and development capacity. national governments had clear strategic visions and policies for the development of the industry at large. Other countries that have adopted strategies to enable the development of aerospace include Ethiopia and Cote d’Ivoire. strategies set forth at the continental level are healthy and sound frameworks. They serve a critical function in raising awareness about the challenges and opportunities Africa faces. As some trailblazing African countries begin to build viable and valuable aerospace capacity, getting these critical components right takes on new urgency for national governments as they benchmark against their peers and explore the economic possibilities in front of them. MANUFACTURING AND INDUSTRIALISATION Building industrial capacity has long been a critical priority for African economic development due to the potential benefits in terms of creating jobs, developing SMEs, turning innovation into commercially viable products and increasing competitiveness. As such, industrialisation is a key feature of the African Union’s Agenda 2063. Building home-grown aerospace, industrial capacity is critical. The scale of high-value skills, direct and indirect jobs, increase in government revenues as well as local and foreign investment is alluring. The rise of aerospace manufacturing clusters and the economic resilience that comes with them – in South Africa, Tunisia and Morocco makes this point. Most examinations of the global aerospace industry begin by valuing “all in-country activities on the development, production, maintenance and support of aircraft and spacecraft.”11 In 2017, the global aerospace industry, including sub-tier suppliers, who account for 54% of the industry’s overall production, was valued at $838 billion. Association (GITAS), a leading Tunisian aerospace industry trade organisation, has 40 member companies. Morocco’s push for international investment in its aerospace sector may serve as a template for emerging nations seeking to develop an aerospace industry. Morocco has seen a rapid growth of its aeronautical sector; official figures through 2016 said the industry had seen export sales grow tenfold, to $1 billion. Revenue growth has risen 17 per cent per year, on average, since 2009. 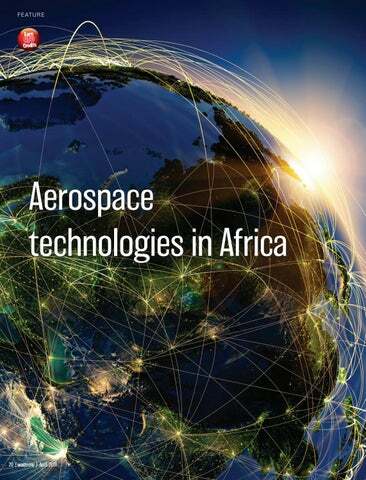 Aerospace Technologies in Africa continues from page 27 and returns compared to other emerging markets. None were advocating for a retreat of capital from Africa but only felt that in a lot of countries the discussion of aerospace industrialisation was slightly premature – often describing the relationship between adequate infrastructure and equity as a “chicken and egg” scenario. Nevertheless, international finance experts see a viable path forward in the long-term through two critical solutions for attracting capital, in conjunction with infrastructure improvements: the ability to secure a sovereign guarantee on financing and the existence of a profitable future business plan. 2018, Google announced plans to open its first global Artificial Intelligence research centre in Accra, Ghana. The company also decided on Lagos in Nigeria when setting up its first Launchpad Accelerator outside its home market in the U.S. Facebook followed suit by launching its hub, even in Lagos. More established African-born hubs like MEST and AfriLabs have also increased their footprint across the continent. Sweeping pan-African policy frameworks are focused heavily on a paradigm shift toward prioritising STEM education and offering incentives for young talent to remain in Africa and contribute to aerospace industry growth. The task falls mainly to national governments to encourage and support this sort of skill development. Projects such as Airbus BizLab, Flatlab and other similar incubators are a step in the right direction as long as they are complemented by supportive, business-friendly policies at the local level and continuing government investment in technical education. the world’s people but accounts for less than 3% of global air service.20 For Africans, the cost of a plane ticket is prohibitively expensive: 45% higher than anywhere else in the world according to industry officials we spoke with. The continent accounts for 30% of earth’s total land area but remains the most challenging terms of road network density. In terms of the distance between its largest population centres, Africa has the third largest distance between them, only behind Latin America and Asia Pacific. to open African skies benefited from the signing of the Single African Air Transport Market (SAATM) by 23 countries, committing to shift toward a continental approach in liberalising the market, which would increase connectivity and reduce the unit costs for both airlines and passengers. IATA supported the African Union’s efforts with SAATM as the only feasible solution for meaningful industry growth. Perhaps most significantly, enhanced air service can facilitate many other sectors by supporting increased trade, attracting new businesses to the region, encouraging investment and boosting productivity. stimulate the growth in a wide range of economic sectors – from manufacturing to construction, to more advanced industries such as telecommunications, finance and professional services. Indirect socioeconomic benefits extend to subsectors such as taxi and transportation services as well as food sales, both of which provide jobs for thousands of people on the continent. The growth of tourism and indirectly air transport is dependent on other government policies like free travel and visa liberalisation. The African Union’s goal of an utterly visa-free continent by 2020 should significantly boost regional traffic. Last year the African Union launched the African Passport program, but this document is currently available only to top diplomats. Seychelles is now the only country to offer visa-free access to all other African nationals. Rwanda implemented a visa-on-arrival system in 2013 that enables African citizens to stay in the country for up to 90 days and since then has seen the number of visitors increase by more than 100%. Aerospace Technologies in Africa continues from page 30 receive their training. As IATA’s senior executive pointed out, many non-African pilots are operating in Africa because they have experience and young African pilots have a hard time breaking into the system. Regional cooperation and crosscountry licensing are vital to keeping the best and the brightest aviation talent on the continent. Partnership on issues like the pilot shortage, which threaten the viability of the industry at large, is essential. Some countries like Ethiopia and Nigeria are pioneering training academies to fulfil their needs but are also open to cooperation with other African countries. IATA’s Airline Training Fund in Africa offered training to nearly 2,500 African aviation professionals this year alone. that creating economies of scale (i.e. panAfrican alliances) would be a good way forward to reduce the unit cost of aircraft and to obtain the trust of the financing institutions. The long-term benefits of implementing frameworks like SAATM will take time, but there are other policy mechanisms that interviewees thought deserved attention – like the Cape Town Convention and Protocol - which enhances legal certainty and lowers the cost of acquiring and leasing modern, fuel-efficient aircraft and many other mobile assets. Putting in place the right infrastructure needed to make an economy run is paramount to attracting capital. link between aviation, infrastructure and the wider socio-economic development of the continent. In 2017, the World Bank’s global portfolio for air transport development projects stood at $1.03 billion with numerous projects across Africa and other developing markets. As of 2017, the African Development Bank has invested in 30 airport projects across Africa. Between 2004 and 2017, around 30 African countries have developed laws or are in the process of drafting PPP laws. However, there have been 17 transactions related to PPPs at a total investment of $8 billion, excluding energy and telecommunication projects. Africa’s Program for Infrastructure Development in Africa (PIDA) envisages 400 such PPP projects, many of which will have direct or indirect links to supporting air transport infrastructure. In the last 10 years, countries such as Ethiopia, Ghana, Ivory Coast, Kenya, Morocco, Nigeria, Rwanda, South Africa, Tanzania, Uganda, and others have entered into forms of PPPs on infrastructure projects across several industries, including the construction of roads, power generation, telecommunications, and now, aerospace manufacturing. Development finance organisations such as the World Bank, the International Finance Corporation (IFC), and African Development Bank (AfDB) also have vast portfolios of projects, including in the air transport segment – often dealing with airport revitalisation, connecting multimodal infrastructure and, occasionally, supporting airlines. SAATM is a massive opportunity for the 23 African governments that have signed it as well as the remaining countries expected to sign – a chance to grow connectivity, increase revenues, codeshare and build alliances between airlines to drive income into African economies. Those countries generate around 70% of the total air travel and are a powerful force capable of bringing long-awaited change. As a policy and practical matter, the public sector’s ability to secure financing is key to increasing the number and viability of PPPs according to finance experts interviewed. can certainly benefit from more private airlines and private concessions of airport infrastructure. Tourism has huge potential on the continent, and its further growth is dependent on the full implementation of a visa-free regime for inter-African tourists and more intra-African travel options for international tourists. The perception of poor safety remains the battle airlines and governments need to win. The reality is that Africaâ&#x20AC;&#x2122;s safety record has been outstanding in the past two years, but there is very little messaging internationally to highlight and support that fact. Lingering perceptions of a poor safety record hurt all African airlines. Another milestone for the SKA radio telescope in South Africa The Department of Science and Technology (DST) has welcomed the adoption of the Integrated Environmental Management Plan (IEMP) for phase one of the Square Kilometre Array (SKA) in South Africa. STRATEGIC ENVIRONMENTAL ASSESSMENT FOR THE SKA PHASE 1 MID-FREQUENCY ARRAY The MeerKAT and the SKA projects are one of the 18 Strategic Integrated Projects of the Presidential Infrastructure Coordinating Committee, as part of the National Development Plan. The National Development Plan is intended to transform the economic landscape in the country, create a significant number of new jobs, strengthen the delivery of basic services and support the integration of African economies. The Department of Environmental Affairs has committed to contribute to the implementation of the National Development Plan by undertaking Strategic Environmental Assessments, to integrate the regulatory environmental requirements for the Strategic Integrated Projects, while safeguarding the environment. In 2015, the Council for Scientific and Industrial Research was appointed to undertake a Strategic Environmental Assessment for the SKA Phase 1 MidFrequency Array, which is to be constructed in the Karoo Region of South Africa. WHAT IS A STRATEGIC ENVIRONMENTAL ASSESSMENT? As defined by Sadler and Verheem (1996), the a Strategic Environmental Assessment is a systematic process for evaluating the environmental consequences of proposed policy, plan or programme initiatives, in order to ensure they are fully included and appropriately addressed at the earliest appropriate stage of decision making on par with economic and social considerations. In South Africa, Strategic Environmental Assessments are undertaken to evaluate the opportunities and constraints of large scale strategic developments at the regional and national scales. 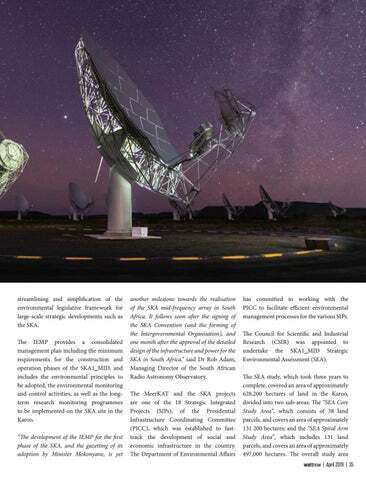 SKA PHASE 1 MIDFREQUENCY ARRAY STRATEGIC ENVIRONMENTAL ASSESSMENT STUDY AREA The Strategic Environmental Assessment covered an area of approximately 628,200 hectares of land in the Karoo, which was divided into two sub-areas. The “SEA Core Study Area” (outlined in red on the map), which consists of 38 land parcels, and covers an area of approximately 131 200 hectares; and the “SEA Spiral Arm Study Area” (outlined in blue on the map), which includes 131 land parcels, and covers an area of approximately 497,000 hectares. The overall study area falls within four local municipalities; the Kareeberg Local Municipality, the Hantam Local Municipality, the Siyatemba Local Municipality and the Karoo-Hoogland Local Municipality. The largest towns surrounding the study area are Carnarvon, Williston, Van Wyksvlei and Brandvlei. The Strategic Environmental Assessment process, which took three years to complete, was guided by a Special Advisory Committee, and included key government departments and state agencies. (e.g. Civil Aviation, Defence, Heritage Resources) also took place, to share information and obtain inputs and expert advice on specific issues/technical aspects of the Strategic Environmental Assessment. terrestrial ecology and biodiversity, including; avifauna, aquatic ecosystems, as well as socio-economic aspects. to further inform local and provincial authorities. The IEMP is the outcome of the Strategic Environmental Assessment. 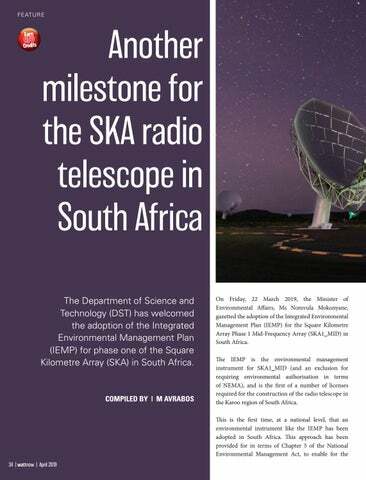 SKA Milestone continues from page 37 of the SKA Phase 1 Mid-Frequency Array, including the environmental principles to be adopted, the environmental monitoring and control activities, as well as the longterm research monitoring programmes to be implemented on the SKA site in the Karoo. The National Research Foundation and the International SKA Organisation are legally required to comply with Chapter 2, and the management outcomes of Chapter 5, of the Integrated Environmental Management Plan. The IEMP supersedes the MeerKAT Environmental authorisations obtained for the KAT 7 MeerKAT EIAs. View showing 10% of the full MeerKAT First Light radio image. More than 200 astronomical radio sources (white dots) are visible in this image, where prior to MeerKAT only five were known (indicated by violet circles). This image spans about the area of the Earthâ&#x20AC;&#x2122;s moon. Since 2006, we have been involved as consulting electrical engineers across a broad spectrum of projects. These include housing estate reticulation, office buildings, warehousing, shopping centres, automobile dealerships, training facilities, and emergency generating systems, to name a few. DEDICATED TO DEsIgnIng yOu A sAfEr grEEnEr EnErgy EffICIEnT fuTurE With a combined 60 years experience, we have developed a niche in various key projects in the electrical and construction industry. We are dedicated to provide the technical skill and service you deserve. The cybersecurity of a business is still mostly reliant on the people within each companyâ&#x20AC;&#x2122;s IT department. This is not sustainable long-term and organisations need to start looking to autonomous security measures to relieve some of the pressure felt by IT teams. The impact that cybercrime has on business alone signifies the importance of having robust and reliable cybersecurity measures in place. However, the rate by which cyber attacks are currently and will continue to take place, along with the increased sophistication thereof, has propelled the importance of cybersecurity to the forefront of critical operational needs. Cybersecurity is not just reliant on deploying secure ICT systems but also on the people who create, monitor and update them, along with those who resolve security threats when alerted to them. This has put a strain on the IT departments of numerous organisations rendering them mostly reactive rather than proactive. REACTIVE IT A reactive IT team is unable to do any planning; they cannot see problems coming and therefore are only aware that issues have arisen as a result of the tangible effects they have on systems, networks and the overall business. This often leaves them scrambling to fix the problems as they come up. Investigating a single security alert can take a significant amount of time due to the scale and complexity of the data involved. Without the time to make better decisions, this can result in increased downtime, loss of money and can leave the department feeling discouraged as theyâ&#x20AC;&#x2122;re not able to create, develop or improve on anything and are instead relegated to a task-oriented role rather than an innovative one. A recent survey conducted by computer software company, Oracle, found that organisations received around 17 180 IT security and management related alerts every week, with 60% of IT executives lamenting the damage that the required amount of resources to manage and maintain infrastructure had on their organisationâ&#x20AC;&#x2122;s competitiveness. Autonomous IT and security solutions will take this pressure off of IT personnel through automated preventive and corrective actions, which will remove the cost and risk from IT operations and increase the rollout speed of other ITrelated applications by freeing up the time of IT teams to serve the business better. What this means is that IT departments will have the ability to move from being reactive to being proactive. of time invested in operational tasks and increasing the time spent on tactical and strategic responsibilities. This leaves them free to help prevent problems, instead of just fixing them, and after that business, executives will be able to make strategic IT decisions that will positively impact business operations and processes. Not only are proactive IT solutions easier to integrate into a budget than unexpected and unaccounted for problem fixes, but utilising autonomous IT and security processes will ensure that there are systems in place to address emergencies that take place with little warning or time for preparation. The result of this is that many common issues will no longer even exist. what it is we’re observing on the Sun.” Melanie Windridge, plasma physicist and science communicator, commented: “Storms caused by coronal mass ejections from the Sun could engulf the Earth, disrupting radio waves, GPS coordinates and overloading electrical systems. A large influx of energy could permanently damage transformers shutting down power supply around the world. The more technologically advanced we become the more vulnerable we are to space weather events”. A solar eruption rises above the surface of the sun. Pictured is the relative size of Earth. These dramatic storms, caused by coronal mass ejections from the sun, hurtle towards Earth, potentially causing widespread devastation. frequent, will usually miss encountering the Earth as this presents a very small target â&#x20AC;&#x201C; from the Sun, the Earth will appear as a dot in the sky. The threat is however real, and measures must be in place to protect vital installations. All electrical distribution grids are well protected against lightning strikes but this protection is irrelevant to the risk from a CME. The threat from a CME is similar to that from the EMP (Electromagnetic pulse) of a nuclear explosion. in 2019. This will have a 4 m aperture as well as adaptive optics. The high resolution should be able to discern features on the Sun as small as 20 km. This will be the worldâ&#x20AC;&#x2122;s largest solar telescope. Solar astronomy is now dominated by the heliophysics space missions, as these have capabilities unobtainable from terrestrial telescopes. Evolving Heliophysics System Observatory. and orbit as a whole with the planet. These five points were discovered by Lagrange while working on the three body problem. The first three were identified earlier by Euler. L1, being between the Earth and the Sun, is useful for Solar observations. L2 is useful for space observatories and will accommodate the future James Webb Space Telescope (JWST). The Hubble telescope is in orbit around the Earth. L3 is not useful as it always remains behind the Sun. Trojans (stray asteroids) tend to accumulate at the L4 and L5 points of planetary orbits. Jupiter has more than a million trojans. Spacecraft stationed at the Lagramgian points need to have fuel and thrusters ready to prevent them from drifting away should the need arise. Let us take a look at a selection of recent and current heliophysics space missions. Ulysses after deployment by Space Shuttle and with rocket motor still attached. and 2007/2008. Operations continued until 30 June 2009. In addition to the Sun, Ulysses also studied several comets. Due to the extended periods remote from the Sun, it was necessary to power the craft by means of a Radioisotope Thermoelectric Generator (RTG). The spacecraft was designed to withstand both the heat of the inner Solar System and the cold at Jupiterâ&#x20AC;&#x2122;s distance. Extensive blanketing and electric heaters protected the probe against the cold temperatures of the outer Solar System. Hydrazine monopropellant was used for course corrections out bound to Jupiter, and later used exclusively to repoint the spin axis (and thus, the antennae) at Earth. The spacecraft was controlled by eight thrusters in two blocks. Thrusters were pulsed in the time domain to perform rotation or translation. Four Sun sensors detected orientation. Ulysses was equipped with several antennae and a large suite of specialized scientific instruments. Solar Orbiter missions and supplemented data from the STEREO mission. WIND was equipped with a large number of specialised scientific instruments and has made a number of significant discoveries. SOLAR AND HELIOSPHERIC OBSERVATORY (SOHO) SOHO is a project of international cooperation between ESA and NASA forming part of the Solar-Terrestrial Science Program (STSP). It was launched on 2 December 1995 with a planned mission life of two years. The mission life has been extended several times and may possibly continue until 2022. SOHO was placed in a lissajous orbit at the Earth’s L1 Lagrangian point, as placing it directly in line with the Sun would have made communications difficult. SOHO went missing on 25 June 1998 but was found by using RADAR of the Arecibo Big Dish on 4 August and rehabilitated. Ulysses showed plasma ejection at much higher velocity at the poles than the equator. This diagram shows only plasma velocity and not magnetic field shape GLOBAL GEOSPACE SCIENCE (GGS) WIND This heliophysics space mission, manufactured by Martin Marietta Astro Space Division, was launched on 1 November 1994 with the following mission objectives: •	Provide complete plasma, energetic particle, and magnetic field input for magnetospheric and ionospheric studies. •	Determine the magnetospheric output to interplanetary space in the up-stream region. Coral Mass Ejections continues from page 49 SOHO’s ability to blank the Sun’s glare allowed it to discover a large number of comets. Michal Kusiak of Polish Uniwersytet Jagielloński (founded in 1364) discovered SOHO’s 1999th and 2000th comets on 26 December 2010. SOHO’s 3000th comet was discovered in September 2015 by Worachate Boonplod, of Samut Songkhram, Thailand. ADVANCED COMPOSITION EXPLORER (ACE) ACE is a NASA Solar and space exploration mission to study matter comprising energetic particles from the solar wind, the interplanetary medium and other sources. Real time data from ACE is used by the National Oceanic and Atmospheric Administration’s (NOAA) Space Weather Prediction Centre, to improve forecasts and warnings of solar storms. The primary scientific objective of RHESSI was to understand the following processes that take place in the magnetized plasmas of the solar atmosphere during a flare: •	Impulsive energy release, •	Particle acceleration, •	Particle and energy transport. These high-energy processes play a major role at sites throughout the universe ranging from magnetospheres to active galaxies. Consequently, the importance of understanding these processes transcends the field of solar physics; it is one of the major goals of space physics and astrophysics. The high energy processes of interest include the following: •	The rapid release of energy stored in unstable magnetic configurations, •	The equally rapid conversion of this energy into the kinetic energy of hot plasma and accelerated particles (primarily electrons, protons and ions), •	The transport of these particles through the solar atmosphere and into interplanetary space, •	The subsequent heating of the ambient solar atmosphere. These processes involve: •	Particle energies to many GeV, •	Temperatures of tens or even hundreds of millions of degrees, •	Densities as low as 100 million particles per square cm, •	Spatial scales of tens of thousands of kilometers, and •	Magnetic containment times of seconds to hours. It is impossible to duplicate these conditions in laboratories on the Earth. The two spacecraft continued to spread apart at about 44 degrees per year. In late 2009 they passed through the L4 and L5 Lagrangian points of the Earth’s orbit where they searched for trojan objects. Trojan objects are commonly found at the L4 and L5 points of a planetary orbit. On 6 February 2011 they were 180 degrees apart given a full view of the Sun. On July 23 2012, STEREO-A was in the path of the solar storm of 2012 which was similar in strength to the Carrington event. Its instrumentation was able to collect and relay a significant amount of data about the event. STEREO-A was not harmed by the solar storm. Communication with the two spacecraft was lost when they arrived at the L3. Attempts to regain contact with the craft were terminated on 17 October 2018. The spacecraft were each equipped with four instruments: •	SECCHI – Sun Earth Connection Coronal and Heliospheric Investigation comprising extreme UV imager and coronagraphs. •	SWAVES – Stereo-WAVES: interplanetary radio burst tracker tracing the generation and evolution of travelling radio disturbancs to Earth. •	IMPACT – In-situ Measurement of particles and CME transients. •	PLASTIC – PLAsma and SupraThermal Ion Composition. This instrument will provide plasma characteristics of protons, alpha particles and their effect on terrestrial communications. Artist’s concept of THEMIS in orbit. TIME HISTORY OF EVENTS AND MACROSCALE INTERACTIONS DURING SUBSTORMS (THEMIS) NASA’s THEMIS was designed to study energy releases from the Earth’s magnetosphere known as substorms, magnetic phenomena that intensify auroras near the Earth’s poles. Launched on 17 February 2007 Themis originally comprised a fleet of five spacecraft of which two were subsequently placed in halo orbits at Lagrangian points of the Moon’s orbit. The satellites each have a mass of 77 kg, carry 49 kg of fuel and have a power consumption of 37 W. The satellites each carry identical instrumentation: a fluxgate magnetometer, an electrostatic analyser, a solid state telescope, a search-coil magnetometer and an electric field instrument. occur where the magnetic fields of the Sun and the Earth connect. These are typically located a few tens of thousands of kilometres above the Earth’s surface. These portals allow huge quantities of solar wind particles to move unhindered from the Sun to the Earth, causing geomagnetic substorms and intensifying auroras. The magnetic portals are very difficult to locate and can be small and short lived or vast, yawning and sustained. When THEMIS concluded in 2010, two of its five spacecraft were repurposed as the ARTEMIS mission. The two satellites were moved to lunar orbits to study the Moon’s interactions with the Sun. SOLAR (ISS) This is an ESA science observatory which is part of the International Space Station. SOLAR is also known as the Solar Monitoring Observatory (SMO). This consists of four grazing incidence grating spectrometers. It was externally mounted on the Columbus Laboratory of the ISS in 2008. The SOLAR platform and its instruments are controlled from the Belgian User Support and Operations Centre at the Belgian Institute for Space Aeronomy. The three instruments are: SOVIM (SOlar Variations and Irradiance Monitor). This is designed to measure solar radiation in the near-ultraviolet, visible and infrared wavelengths. In 2012 the entire 450 ton space station was rotated so that SOLAR could observe a full rotation of the Sun. A solar rotation takes about 24-28 days depending on the latitude. SOLSPEC (SOLar SPECtral irradiance measurements). Measurements in the 165 to 3000 nanometre range with high spectral resolution. SOL-ACES (Auto-Calibrating Extreme ultraviolet and ultraviolet Spectrometers). PICARD MISSION The PICARD mission is dedicated to the measurement of total spectral solar irradiance, the diameter and shape of the Sun and the Sun’s interior by the helioseismology method, as well as the influence of solar activity on the climate of the Earth. This was launched together with the Prisma spaceraft in a low geocentric orbit on 15 June 2010 from the Dombarovskiy Cosmodrome, Russia. The mission ended on 4 April 2014.
imaging overlaid by animations derived from Navier-Stokes, reaction diffusion, perlin noise and fractal flame equations. Spectators could disturb the animations in real-time by using an iPhone. Perlin noise equations are used to give computer generated animations a ‘natural’ look. DEEP SPACE CLIMATE OBSERVATORY (DSCOVR) DSCOVR is a NOAA space weather, space climate and Earth observation satellite. It was launched by SpaceX on 11 February 2015 and placed at the L1 point of Earth’s orbit. DSCOVR has succeeded ACE and become the primary system for warnings in the case of Solar magnetic storms. DSCOVR’s orbit also gives Earth scientists a unique vantage point for studies of the atmosphere and climate by continuously viewing the sunlit side of the planet. The EPIC camera provides global spectral images of Earth and insight into Earth’s energy balance. EPIC’s observations provide a unique angular perspective, and are used in science applications to measure ozone amounts, aerosol amounts, cloud height and phase, vegetation properties, hotspot land properties and UV radiation estimates at Earth’s surface. Payload instruments are: •	PlasMag (Plasma Magnetometer) measures solar wind for space weather early warning predictions. Being placed at the L1 gives 15 to 60 minutes warning of CMEs approaching Earth. Instruments utilised are: Magnetometer for measuring magnetic field; Faraday cup for measuring positively charged particles; and an electrostatic analyser for measuring electrons. spacecraft operates and reacts to the solar environment, and I’m proud to say the team’s projections have been very accurate.” Nour Raouafi, a project scientist on the probe who’s also at APL remarked: “We’ve always said that we don’t know what to expect until we look at the data. The data we have received hints at many new things that we’ve not seen before and at potential new discoveries. Parker Solar Probe is delivering on the mission’s promise of revealing the mysteries of our sun.” The mission design uses repeated gravity assists at Venus to incrementally decrease its orbital perihelion to achieve a final altitude (above the solar surface) of approximately 6,16 million km and a speed of 690 000 km/h. The spacecraft trajectory will include seven Venus flybys over nearly seven years to gradually shrink its elliptical orbit around the Sun, for a total of 24 orbits. The near Sun radiation environment (650 kW/m2) is predicted to cause spacecraft charging effects, radiation damage in materials, and electronics and communication interruptions, so the orbit will be highly elliptical with short times spent near the Sun. The hexagonal solar shield, mounted on the Sun-facing side of the spacecraft is 11,4 cm thick, and is made of reinforced carboncarbon composite, with white reflective alumina surface. It is designed to withstand temperatures outside the spacecraft of about 1370 °C During PSP’s 24 total flybys, its instruments will help researchers understand the inner workings of the sun and how it accelerates solar material at high speeds, as well as what makes the star’s corona, so much hotter than the solar surface. PSP started its second solar flyby on 4 April 2019 at an altitude of 24 million km. The orbital period, initially 150 days, will decrease to 88 days by end of mission. To achieve its goals, the mission will perform five major investigations, each with their own suite of instruments: •	Electromagnetic Fields Investigation. •	Integrated Science Investigation of the Sun. •	Wide-field Imager for Solar Probe. •	Solar Wind Electrons Alphas and Protons. •	Heliospheric Origins. QUESTION ONE How do you protect electric motors against overload and short circuit conditions? ANSWER ONE The best option to protect electric motors against overload and short circuit conditions is by installing both overload and magnetic circuit breakers. This ensures that the devices back each other up and protect other devices in the circuit as the upstream protection devices safeguard the downstream protection devices from excessive short-circuit current. This is necessary should a device not be able to switch the prospective short-circuit current without a backup in the case of a fault. The majority of winding failures in electric motors are caused, either directly or indirectly, by overloading (either prolonged or cyclic) or single phasing. The excessive heating caused by overloading will lead to the deterioration of the winding insulation until an electrical fault occurs. QUESTION TWO What is overload protection? For example, some equipment may create inrush currents on startup. These inrush currents typically last only a few seconds and rarely cause a problem. Overload relays are used in an electric motor circuit to protect electric motors from damage caused by prolonged periods of overcurrent. QUESTION THREE How does the thermal protection principal work? ANSWER THREE Thermal protection works using a bimetallic strip which bends due to the heat caused by the current flowing to the electric motor and activates a trip lever. This trip lever switches one or several auxiliary contacts which interrupts the supply to the contactor and disconnects the electric motor from the circuit. bimetallic strips. These are sophisticated devices that use electronics to monitor the motor current continually and protect against overload. Electronic overload relays offer an extensive range of communications options such as Profibus, Modbus, DeviceNet, Modbus TCP, Profinet, and Ethernet or serial connections to PLC’s. Electronic overload relays also offer a full range of monitoring and protection functions, as well as greater accuracy and flexibility when compared to a standard thermal overload relay but are more expensive. Most electronic overload relay models don’t offer short circuit protection and must be coupled with an upstream magnetic circuit breaker for short circuit protection. QUESTION FIVE What is short circuit protection? A thermal overload relay, commonly called a ‘thermal overload’, is a device which is usually connected directly to a contactor. It offers overload protection only and must, therefore, be coupled with an upstream magnetic circuit breaker for short circuit protection. Thermal overloads are generally cost-effective, reliable and simple to install so are widely used for electric motor control. QUESTION FOUR How does electronic motor protection work? ANSWER FIVE A short circuit occurs when a current travels along an unintended path, often where essentially no or a very low electrical impedance is encountered. Short circuit protection is protection against excessive currents or current beyond the acceptable current rating of equipment, and it operates instantly. As soon as an overcurrent is detected the device trips and breaks the circuit. QUESTION SIX How does the principal work? Magnetic protection uses an electromagnetic mechanism to trip the circuit instantly when the current reaches a certain threshold. It is generally set to trip at ten or more times the electric standard motor running current to avoid tripping during normal motor starting. Why do electric motors require both thermal overload and short circuit protection? QUESTION SEVEN What is the most cost-effective device that can be used to protect electric motors against overload and short circuits? ANSWER SEVEN Also known as a motor circuit breaker, a motor protection circuit breaker is a switchgear device which includes both overload and short circuit protection in a single compact frame. It differs from a standard MCB (miniature circuit breaker) in that it allows the user to preset the exact motor sizing for perfect protection. Motor circuit breakers are very common in industrial motor starting applications. ANSWER EIGHT Since a thermal overload relay will not interrupt the circuit in the case of a short-circuit the installation of additional upstream protection is necessary for short circuit protection. There are several IEC standards covering protection devices for use in electric motor starting and protection applications. Selecting the correct and most appropriate components for an application is essential and will provide considerable benefits such as reduced downtime as well as lower maintenance costs. RELIABLE PRODUCTS & SOLUTIONS for the entire industry. Zest WEG Group is able to offer a range of standard off-the-shelf products as well as end-to-end energy solutions by leveraging best practice engineering and manufacturing capabilities. All products are engineered to facilitate a safe and reliable environment with operational stability and the highest possible production levels as an objective. Reduced maintenance and ease of serviceability assist in lowering the total cost of ownership. L OOKI NG B A C K . . .
April in History April is the fourth month of the year in the Gregorian calendar, the fifth in the early Julian, the first of four months to have a length of 30 days, and the second of five months to have a length of less than 31 days. 1904	Henry Ford, was age 39 when construction of the first purposebuilt Ford factory was authorised by the stockholders, just 10 months after Ford Motor Company was founded. 2 APRIL 1800	Ludwig van Beethoven lead the premiere of his First Symphony in Vienna. 3 APRIL 1866	A hat shaping machine was patented by Rudolph Eickemeyer and G. Osterheld. 4 APRIL 1873	The Kennel Club (“KC”) was founded. It is the oldest and first official registry of purebred dogs in the world, as well as being the official kennel club of the United Kingdom. Van Riebeeck arrived at the Cape with three ships, and the intention to set up a refreshment station for ships passing by on their trade route. The first distinguishable echo was recorded of a radar signal bounced off the Sun. It is considered to be a milestone in the emerging field of radar astronomy. A three-person team from the Radioscience Laboratory, Stanford University, California, USA, led by electrical engineering Professor Von R. Eshleman, recorded an echo from the outer corona of the sun, 17 minutes after transmission. They used an IBM computer for signal processing. SpaceX successfully made the first soft return landing of a reusable Falcon 9 rocket booster on to a robotic drone ship at sea. SpaceX, a private spaceflight company, therefor accomplished a feat done by nobody ever before. Rugby union SANZAAR ((South Africa, New Zealand, Australia and Argentina Rugby) the body which operates Super Rugby and The Rugby Championship competitions) announced that three teams would be eliminated from Super Rugby after the current season. One team from Australia and two from South Africa will be axed, reducing the competition to 15 teams. 1925	The Great Gatsby by F. Scott Fitzgerald was first published in New York City, by Charles Scribner’s Sons. The story, which primarily concerns the young and mysterious millionaire Jay Gatsby and his quixotic passion and obsession with the beautiful former debutante Daisy Buchanan, sold poorly and Fitzgerald died in 1940 believing himself to be a failure. During World War II it experienced a revival and became part of high school curricula worldwide in the following decades. Today, The Great Gatsby is considered to be a literary classic. 1985	On board the Space Shuttle Discovery mission 51-D when it blasted off was the first yoyo taken into space. The yellow plastic Duncan Imperial yo-yo, a gyroscope and other toys were ‘played with’ during the time in orbit in order to compare their behaviour in microgravity with normal play on the Earth’s surface. A smoking deterrent - a pseudocigarette package that produces simulated coughing sounds when the package is picked up - was issued a US patent to its inventor, Lewis R Toppel of Chicago, Illinois. According to the patent abstract, “The simulated coughing noises are produced from a batterydriven disk recording played through a miniature loudspeaker in the package". The acting profession’s top award went to a black actor for the first time; Sidney Poitier won the best actor Oscar for his role in Lilies of the Field. In the film, released the year before, he played construction worker Homer Smith whom a group of nuns believe was sent to them by God to build their church. L OOKING B A C K . . .
April in History continues from page 63 earlier dictionary. Because it was based on the principle that word usage should evolve from the spoken language, the work was attacked for its “Americanism,” or unconventional preferences in spelling and usage, as well as for its inclusion of non-literary words, especially technical terms in the arts and sciences. The first procedure in Britain to implant “bionic” eyes was carried out at Moorfields Eye Hospital, London, on two blind patients with retinal pigmentosa but intact optic nerves. After the 4-hour operation, the patients were able to perceive an array of spots of light showing crude shapes and movements. 16 APRIL 2016	Axl Rose (previously with Guns ‘n Roses) was confirmed as the replacement singer for AC/DC. Brian Johnson had left the band due to a potentially career-ending hearing problem. simplified program writing. The first FORTRAN program (other than internal IBM testing) ran at Westinghouse, producing a missing comma diagnostic. It was successful. 17 APRIL 2014	NASA’s Kepler space telescope confirmed the discovery of the first Earth-size planet in the habitable zone of another star. Kepler-186f is an exoplanet orbiting the red dwarf Kepler-186, about 582 lightyears (178.5 parsecs, or nearly 5.298×1015 km) from the Earth. 18 APRIL 1925	The first Woman’s World’s Fair in U.S. was officially opened in Chicago, Illinois, by Mrs Calvin Coolidge. For eight days, it displayed women’s progress in 70 industries. This showed the diversification since the 1893 World’s Fair, where the only example of woman’s handiwork was the sewing exhibit. 20 APRIL 1902	Pierre and Marie Curie isolated one gram of radium, the first sample of the radioactive element. They had refined it from eight tons of pitchblende ore.
21 APRIL 2018	Nabi Tajima, a Japanese supercentenarian and the world’s oldest person at the time, died at age 117 in southern Japan. She was the last validated person born in the year 1900.
as a spaceplane. The X-37 was operated by the United States Air Force for orbital spaceflight missions intended to demonstrate reusable space technologies. The Boeing X-37 began its first orbital mission. It successfully returned to Earth on December 3, 2010. 23 APRIL 1990	Namibia became the 160th member of the United Nations and the 50th member of the Commonwealth of Nations. message traffic transmitted at high speed by Morse code using paper tape machines. Although the idea was conceived prior to WWI, the United Kingdom was the last of the world’s great powers to implement an operational system. 25 APRIL 1983	American schoolgirl Samantha Smith was invited to visit the Soviet Union by its leader Yuri Andropov after he read her letter in which she expressed fears about nuclear war. 26 APRIL 1803	Thousands of meteor fragments fell from the skies of L’Aigle, France; this event convinced European scientists that meteors do exist. 27 APRIL 2005	Airbus A380 aircraft had its maiden test flight. The A380 was introduced into service on the 25th October 2007 by Singapore Airlines. 28 APRIL 1973	Pink Floyd’s eighth album, The Dark Side of the Moon, recorded in Abbey Road Studios, England, went to number one on the US charts, beginning a record-breaking 741-week chart run. The album was released on 1 March 1973 by Harvest Records. Brazil surfer Rodrigo Koxa broke the record for the largest wave ever surfed. The wave occurred off the coast of Nazaré, Portugal and measured 24.4 metres. 30 APRIL 1905	Einstein completed his thesis, with Alfred Kleiner, Professor of Experimental Physics, serving as pro-forma advisor. As a result, Einstein was awarded a PhD by the University of Zürich, with his dissertation “A New Determination of Molecular Dimensions”. The Earthing and Lightning Protection Association (ELPA) was formed to bring the industry together, reduce the burden and upskill engineers to protect the consumer, establish a uniform interpretation of the codes of practice, and help to regulate and advise the lightning protection industry. Join uS TodAy And STArT mAking A diffErEncE! Airbus released The Great Enabler: Aerospace in Africa - a white paper on the role of aerospace technologies and their impact on socio-economic development in Africa. The extensive report looks at how different segments of the industry can address a core set of challenges on the continent. The Mechanical and Aeronautical Engineering Department at the University of Pretoria runs a multinational, multidisciplinary vertically-integrated engineering design project focused on developing modular drone solutions for wildlife protection applications. Dr Lelanie Smith, manager of the AREND project, started this initiative as a result of a request from the University of Boulder, Colorado in 2014.